If you've been around and have seen some of my updates, you may know that my daughter has issues with breathing attacks sometimes while she's in gym at school or during her soccer games. I believe the attacks started last May during the soccer season. It was really scary for all of us. I told her pediatrician about it at my kids' annual well visit last year. At that point in time the doctor said that if it continued to happen we could "play with an inhaler" to see if it helped. We actually kind of forgot about it over the Summer last year because it never really happened. Then school began again last Fall and she had an attack at gym. At that point we decided to make an appointment with the pediatrician again to see about that inhaler. In the beginning we were supposed to use the inhaler before strenuous activity for two weeks to see if it helped. After that we were only supposed to use it as a rescue inhaler. We used it that way and then used it as needed. Then, soccer season ended and we kind of forgot about it again. And we went back and forth like that until now. A couple weeks ago we finally made an appointment with a pediatric pulmonologist to see if we could figure this thing out and to see if there was something better that we could be doing. My daughter is a pretty good soccer player and we don't want her to be held back by breathing issues! We went for her appointment this past week. We had some kind of lung function tests done in the office at the pulmonologist. It was actually really cool. Everyone was really friendly at this particular office. The specialist that does the tests gave my daughter the tube that she was supposed to blow into and explained what she had to do each time. I thought about getting pictures, but I didn't actually take them! (bad blogger!) I didn't want to detract from the whole situation though. The tube that she had to breathe into was attached to a computer somehow. There were different things on the computer screen that she had to "move" or "inflate." For example, in one of the exercises she had to blow up a hot air balloon. The process went like this: she was supposed to breathe in and out quickly two times and then take a deep breath in and then blow it out as strong as she could until the technician told her to stop. Sometimes, her tongue got in the way and she had to do the test again. Somehow, he was able to tell by looking at the numbers if her tongue got in the way. She did about three or four of the tests ~~ they were different each time. One time she had to "knock down bowling pins", one time she had to inflate the hot air balloon. One test might be to blow out candles, etc. Once she did that about four times, we went back into the exam room and she had to take four puffs from her inhaler. They actually watched her take her inhaler also, to make sure she was doing it right. Truthfully, my hubby and I have no idea whether she was doing it right or not. Neither one of us have ever had to deal with asthma or inhalers before. Turns out that she uses the inhaler perfectly. Four puffs on her inhaler is supposed to be equal to the nebulizer that they would normally use if the kids don't already have an inhaler. At that point, they did the lung function test again to see if there's a difference after using the albuterol. Between those tests and the doctor asking several questions, the doctor determined that it is more than likely NOT asthma. He thinks that it could be Vocal Chord Dysfunction. When she first started having the attacks last May and we were researching online, that was one of the conditions that popped up in our search. I told my husband then that the symptoms she was having sounded like that. The doctor thinks that it could be happening because of possible heartburn-type issues and because my daughter could be putting a lot of stress on herself. I'll just tell you that she's an intense little person by nature. She's the prime example of "leaving everything on the field." What kind of grades does she have? Does she cough before the attack comes on? Is there pain in the chest, if so what is it like? Stabbing, heavy, dull, etc. Is there a family history of heart conditions or holes in the heart? Does she cough a lot in general? Does it seem like colds are always in her chest and like it lasts longer than most kids? When we use the inhaler~~do we have to use it again during games, etc.? I truthfully don't remember all of the questions. And it's tough to answer the questions about what happens during the attack because we're all a little stressed out just trying to get her through it. Chest X-ray to make sure there's nothing unusual going on. Take an acid blocker for six weeks to reduce the chance of heartburn. Stop using the inhaler to see if it even makes a difference. Try to take a video while she's having an attack so that the doctors have a better idea of what's going on. She did have another attack yesterday while she was playing soccer. A lot of times the attacks come on after she's been hurt. Yesterday, someone accidentally stomped on her foot~~seriously, you should see the bruises!~~it had to have hurt! It takes a couple minutes. I think the anxiety of the pain causes her to start the breathing issues. I would say that happens at least 50% of the time when she has an attack. Of course, I ran out to the field to help her off the field and I was holding an umbrella because it was raining. It didn't even cross my mind to grab my phone to record her! The poor little thing was so frustrated because she went to the doctor so that we could figure this thing out but "it didn't help!" She doesn't understand that we're going to have to go through the therapy so that she can learn how to control it. So, that's our next big step. We need to set up our appointments for the therapy for Vocal Chord Dysfunction. The doctor gave us a packet that kind of explains a little bit more about it. It explains that most of the time, it happens to females. It can happen to males also, but MOST of the time it happens to females. Wish us luck as we continue on this journey and figure out how to deal with this. 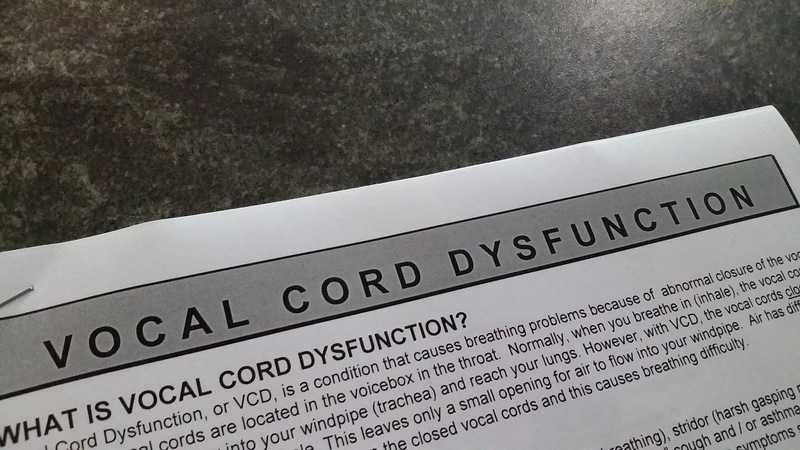 Have any of you ever had to deal with Vocal Chord Dysfunction before?